Mel Blanc Day @ Lincoln Hall/ Wednesday June 29, 7:30 PM. Free admission! In the fourth and final lecture in the Mel Blanc Lecture Series, which takes place 7:30 PM at 1620 SW Park Avenue on June 29, we will turn our attention to radio. What role did Portland radio play in creating the Man With A Thousand Voices? 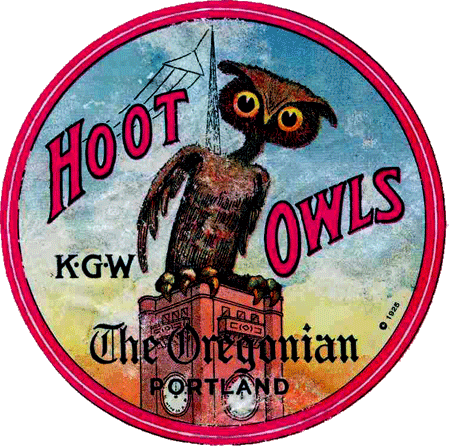 KGW’s Hoot Owls, a weekly hour and a half long show with more than one million listeners, began broadcasting from the Oregonian Tower in 1923. Mel Blanc became a card carrying member, as a listener, that same year. He joined the cast in 1927. He moved to KEX to create in his own daily show, Cobwebs & Nuts, in 1933. He left for Los Angeles in 1935. We asked Craig Adams and Robyn Tenenbaum to come help us unravel the question of the influence Portland radio had on Mel Blanc. We call these events “lectures”, but it might be more accurate to call them onstage conversations, which the audience is invited to join. Portland early radio historian Craig Adams will talk about Portland’s early adopters, who created radio here when it was a brand new technology/artform. He’ll tell us about the radio Mel Blanc grew up with, and later came to help create. Robyn Tenenbaum, producer of Live Wire Radio, brings two of Live Wire’s most illustrious stars, Courtenay Hameister and Sean McGrath, with her. All three will provide their updated perspective of Portland radio. Film archivist Dennis Nyback will show a GI Journal, featuring Mel Blanc performing live as a voice artist. A rare 16mm film, which also features Lucille Ball and Jerry Colonna. 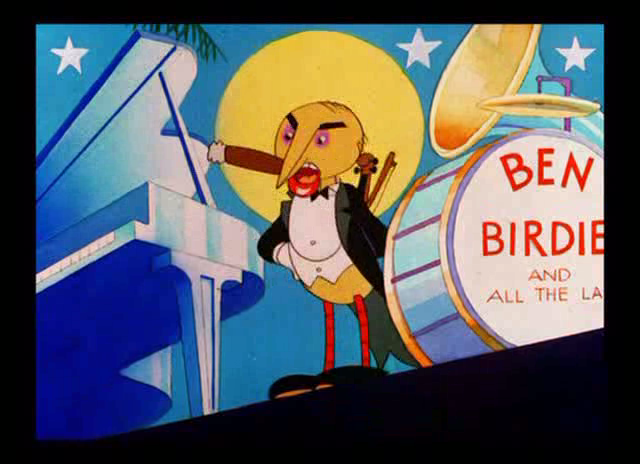 Dennis will also show I Love To Singa (1936), a Warner Brothers cartoon spoofing The Jazz Singer which stars a young Owl Jolson making his radio debut. Vox, a vocal/spoken word choir, will perform Mayor Sam Adams’ official proclamation that June 29, 2011 is Mel Blanc Day in Portland. Mel Blanc T shirts will be given to the winners of our Mel Blanc Trivia Contest. Opening the evening is Portland’s hot ukulele band, Honky Tonk Prison, led by Amos Hunter. At the end of the evening, Craig Adams and Robyn Tenenbaum will induct Mel Blanc into Oregon Cartoon Institute’s Hall of Fame. This evening is co-sponsored by Oregon Cartoon Institute and PSU School of Fine & Performing Arts. Lincoln Hall, Mel Blanc’s former high school, is located at 1620 SW Park Avenue, in Portland. Special thanks to civic minded Oregon Cartoon Institute member and calligrapher extraordinaire, S. W. Conser! Oregon Cartoon Institute’s Mel Blanc Project is a series of public history/art education events made possible in part by a grant from the Kinsman Foundation and by a grant from the James F. and Marion L. Miller Foundation. Another recommended method of deepening your knowledge is to attend the entire lecture series, Mel Blanc: The Portland Years.